Colorado Springs Utilities has started making changes to burn wood biomass at one of its power plants, and it looks to be a double-win; they will be using biomass from beetle-infested trees as fuel and reducing greenhouse gases. Power utilities are finding that wood is good-especially when it comes to burning less coal to produce power. Colorado Springs Utilities is a case in point. By blending 15 percent woody biomass with coal for use as fuel in one of its power plant boilers, Colorado Springs Utilities anticipates that it will burn 75,000 fewer tons of coal annually once the plant's fuel resources are fully integrated by 2011. An additional bonus is that they are making use of woody biomass consisting primarily of beetle-infested wood and understory wood fiber that represents a fire hazard. With modifications made to the Martin Drake power plant to accept woody biomass, it will become one of the few power plants in the United States capable of burning three types of fuel: coal, natural gas, and woody biomass. Columbia and has created an extreme fire risk in large swaths of that forest. In addition to representing a significant fire hazard to homes and communities, dying trees and the aftermath of forest fires have the potential to damage the environment and water resources due to soil erosion. Fires also impact the local tourism industry. All in all, there is a strong desire to cull infested trees to capture some value from them as a fuel source to generate power, before Mother Nature sets fire to the forest. Meikle says there are about five million acres of beetle-infested forest in the Colorado Forest District at present, and it is "increasing every day." "It is an epidemic," he says. "There is a 20-year supply of woody biomass from dead or dying trees within a 75-mile radius of the Martin Drake Power Plant." Woody biomass from the forest is only one of the utility's fuel procurement channels. It will also use processed fuel from urban wood waste, pallets, and sawdust. In fact, it has already started to blend sawdust with its coal, because sawdust is an abundant local resource and does not require pulverizing in advance of blending. It is also an abundant local resource. A local contractor, Rocky Top Resources, has been hired to collect, screen, and deliver the sawdust material acquired from local wood product manufacturers, such as furniture makers, and deliver it to the power plant. 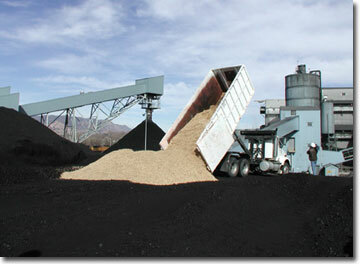 Over 1,000 tons of sawdust and small wood chips have been blended with coal to produce power since 2006. 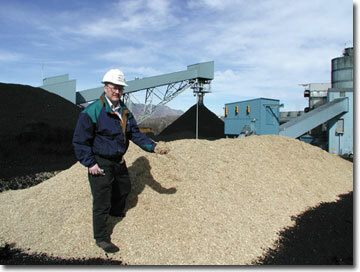 In addition to caring for the environment, the ability to blend woody biomass with coal makes good business sense, says Terry Meikle (above), manager of bioenergy at Colorado Springs Utilities. Meikle believes pricing for the delivered biomass will be very competitive with the coal currently being shipped to the plant. Colorado Springs Utilities is investing about $10 million to construct a biomass receiving, storage, processing, and injection system to prepare the power plant to receive the woody biomass feedstock. The company hopes that some of the capital cost will be covered by renewable energy grants. It has applied for a $5 million grant from the U.S. Department of Energy and has been awarded a $250,000 Wood Biomass Utilization grant from the U.S. Department of Agriculture. One of the pressing questions related to the use of woody biomass as a substitute for coal is what environmental benefits it has to offer. Meikle says woody biomass releases significantly smaller amounts of greenhouse gases when burned, and the sulfur content in air emissions is very low compared to coal-in the neighborhood of 0.02 percent versus 1.5 to 2 percent for coal. Tests conducted by the utility show that it also releases smaller amounts of nitrous oxide gases, and it has much lower ash content. "The ash content in woody biomass is less than 0.5 percent, whereas some of our coals are running in the range of 12 to 13 percent ash," says Meikle. "So we have less material to landfill, and we also see savings in the cost of transporting the ash to the landfill, burying it, and then having to expand the landfill." The job of acquiring the woody biomass, processing it down to three inches in diameter or smaller with less than 20 percent moisture content, and delivering it to the plant is being contracted out. Contractors have been asked to consider using 80 to 100 cubic yard trucks, which would amount to about 20 truckloads per day or about 750 tons per day of biomass. The power utility has contracted for 100,000 tons per year and would look favorably on transportation of biomass to the power plant by rail. "It's expected to be clean, non-contaminated fuel, in the range of 7600 BTUs per pound and up," says Meikle. "The boiler is estimated to consume somewhere around 15 tons per hour, representing about a 15 percent co-firing rate on a 130 megawatt unit, which then equates to approximately 110,000 tons per year." The utility will build an automatic sampler into its system so that it can accurately measure and analyze woody biomass attributes such as moisture, BTUs, sodium, sulfur, and chlorine content as it arrives. During the recent contractor bidding process, there were over 20 companies indicating their intent to bid on the biomass supply contract. "That was awesome," says Meikle. "I was hoping for three or four. That is a reflection of the economy and the forest industry. The forest industry in Colorado is depressed, so this has sparked a lot of interest." The modifications being made to the Martin Drake power plant-so it can accept woody biomass-will result in it being one of the few power plants in the United States capable of burning three types of fuel: coal, natural gas, and woody biomass. The utility will take charge of the raw material once it arrives at the plant site. The woody biomass will most likely be weighed, unloaded into a hopper, and then conveyed to a silo, allowing for a three to five day supply on site. There will be no on-ground biomass storage. 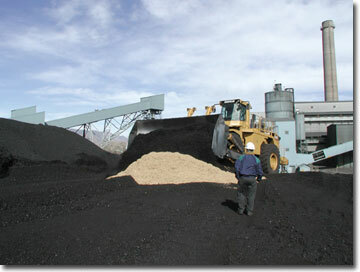 Colorado Springs Utilities operates what is called a pulverized boiler at the power plant. With this type of boiler, the coal is ground to the consistency of talcum powder and combusts in the furnace within three to six seconds. This type of combustion presents specific challenges when co-firing with woody biomass-one of the biggest being the need to pulverize the biomass (1/16"-1/8" in size) before it can be fed into the boiler for the release of all of its energy within that three to six second dwell time. Meikle emphasized that a 15 percent biomass mix is just a starting point and is based on 30 trucks per day, which is about as many as the plant can handle. However, the final blend will be determined after boiler manufacturer Babcock and Wilcox concludes its engineering study of a new fuel flow and burner system. The utility is working with Babcock and Wilcox on boiler flow modeling to determine what impact a 15 percent blend of woody biomass will have on the boiler's internal components, looking specifically at the super heater, reheaters, and economizer. This evaluation will also include a new burner design as well as re-burn over-fired air technology that has the potential to reduce greenhouse gases even more. Meikle says the plan currently is to install new separate burners and air supply ports. How the system works, in theory, is that the coal feeders and boiler master control will sense the higher BTUs being generated from the injection of the woody biomass fuel and will back off on the amount of coal being injected into the boiler, thus reducing coal consumption. The over-fired air injection with re-burn technology that will be used in this application is something Babcock and Wilcox is developing for its pulverized boilers, and they have expressed an interest in doing research and development work within this project. "I think we could be leading the industry in developing a commercial biomass over-fired air re-burn technology for a pulverizing boiler," says Meikle. "So we want to perform the due diligence and research to ensure the success of a viable biomass co-firing unit." While the power plant is being designed with woody fibre in mind as the main co-firing feedstock, the utility is looking seriously at other biomass fuel options as a back-up to wood. There are a number of options, such as biomass from herbaceous and agriculture crops, as well as from recycled paper. Meikle says there seems to be a number of other options available, and even though these other fuel sources may be a bit more expensive, the utility will still be able to produce green power at less cost than some other renewable sources, such as wind and solar. "I have not stopped at just the woody biomass supply," Meikle says, "because if that dried up, we've got a $10 million equipment investment sitting there, and we won't be able to use it. Now we have mitigating fuels." Colorado Springs Utilities has a history of being proactive in addressing environmental concerns raised by its customers, and because of the amount of power it generates from hydro installations, it has already achieved its requirement of 10 percent power generation from renewable sources by 2020, as mandated by state legislators. There is currently a proposal to increase the state's renewable energy standard to 20 percent by 2020. "I have worked for two other utilities, and this is the most environmentally caring utility I have ever worked for," says Meikle. But the ability to blend woody biomass with coal goes beyond just caring for the environment. It makes good business sense. Meikle believes that pricing for the delivered biomass will be "very competitive" with the coal currently being shipped to the plant from Northern Colorado and Wyoming.